William F. Wait, Manufacturer, was born at Hagerman's Mill, near Amsterdam, NY., March 1, 1846, being a son of William Wait, who was for many years, a manufacturer of carpets and merchant at Whitehall, NY. Mr. Wait received a common school education, and in the store and factory received his early training. In 1871 he came to Auburn and associated with G. H. Nye, under the firm name of Nye & Wait. This firm, in 1889, was incorporated as the Nye & Wait Carpet Company, of which he is Vice-President and General Manager. Mr. Wait is also one of the founders and Second Vice-President of the American Axminster Industry of Auburn, and First Vice-President of the Cayuga County Savings Bank. In public life Mr. Wait served as Water Commissioner from the time the city purchased the property until 1903, for six years of this time being President of the Board. 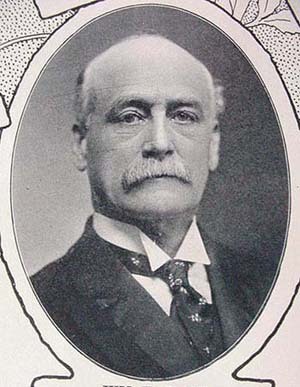 William Wait was married to Lydia R. Bryan (1848-1913). They lived at 211 Genesee Street, a site now occupied by an apartment house. 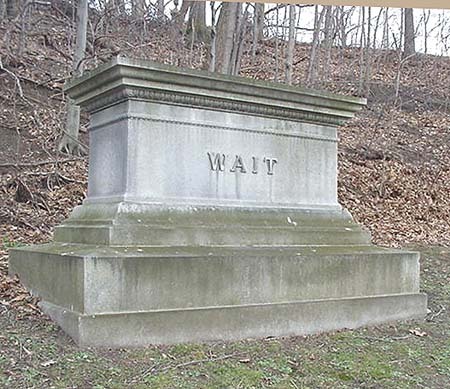 The Wait monument is located in the Cemetery's Consecration Dell section.